Gasteruptiidae is one on the most easily recognised families of parasitic wasps. They are particularly distinctive because of their slender, subclavate metasoma, the dorsal articulation of the metasoma to the propodeum, the elongate, neck-like propleura, and expanded hind tibia. The female of Gasteruption jaculator has a very long ovopositor with a white end. The larvae of Gasteruptiidae are reported to be predators of various solitary bees and wasps. One finds it on the ombelliferae in summer. Gasteruption jaculator belongs to the super-family of the Evanioidea and not of the Ichneumonidae, which have longer antennas (at least 16 articles) and parasitize especially Lepidopterae. Le Gast�ruption � javelot (Gasteruption jaculator) est une gu�pe tr�s particuli�re appartenant � la superfamille des Evanioidea. Son gastre, long et fin, est attach� au sommet du propodeum. Au repos, ses ailes sont pli�es le long du corps. La femelle a un tr�s long ovopositeur (aussi long que le reste de l�insecte) avec une extr�mit� blanche. On le trouve sur les ombellif�res en �t�. La femelle d�pose son oeuf dans l'habitat d'une abeille solitaire. La larve va alors d�vorer la larve ou l'oeuf de l'abeille et se nourrir des r�serves de pollen et de nectar entrepos�es. So very well done this is an excellent shot of Gasteruption jaculator. good detail and natural colours. A good POV/DOF. welldone TFS. bravo pour la photo qui est tres reussie avec une bonne profondeur de champ et merci pour cette note tres instructive. A fine macro of this interesting-looking female parasitic wasp. The ovipositor is almost as long as of those that are parasitic on wood insects. It is taken from a fine POV with excellent sharpness, DOF and contrast with the OOF BG, though a couple of much smaller wasps are also visible. Hi Catherine. An amazing close up of this insect. Which you have taken with good detail and bright colours. A good POV so we can see the body . a nice POV/DOF. well done ,TFS interesting notes too. Not the easiest guys to capture. Nice framing! A fine close up of a strange looking critter Catherine, that ovipositor, or whatever else it is, looks formidable indeed in this correctly exposed and focused capture. TFS this nice image my friend. very neat and lively capture of this "parasitic wasp". I like the light management overall. DOF and pOV are superb. I like this close-up of the wasp. 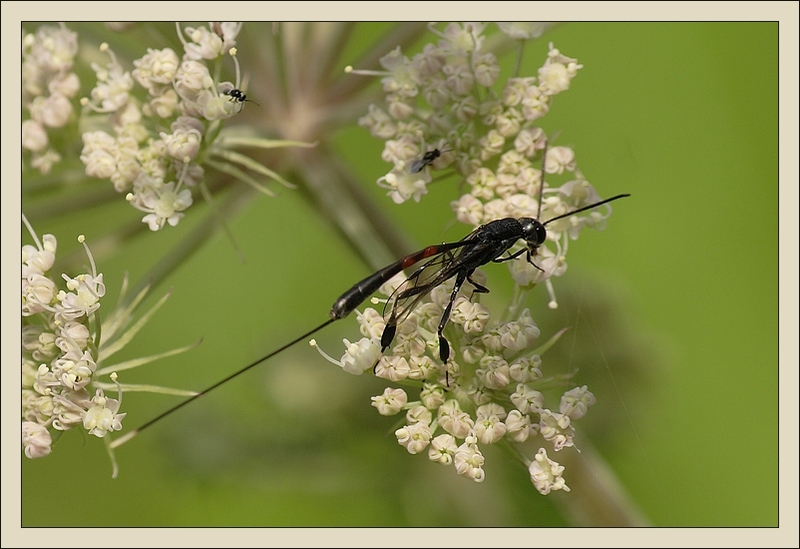 You have chosen a good composition with the slender body of the insect placed diagonaly in the image. As alois in your photos there is a nice soft light rendering such a reachness of color tones. You have found a good way to blend the color tones of the flower with the green and blurry background. Togehter with the sharpness of the insect gives to the image a nice depth. Excellente photo de cette gu�pe. Excellent focus et superbes d�tails. J'aime beaucoup la composition tr�s d�licate entre la finesse des fleurs et celle �galement de cet insect. Tr�s bonnes couleurs �galement. good pov fine light, marvelous dof and good details, a fine photojob here, have a nice evening.